When visitors arrive at St. Basil the Great Ukrainian Catholic Mission in Charlotte, North Carolina, they often seem perplexed to see that we have no pews. They stop for a moment, look around, and then immediately make their way to one of the chairs that line the two long walls on each side of the nave. Once liturgy begins, they once again are surprised to find themselves spending roughly the next two hours on their feet and sitting, unless they tire from standing that long, only during the homily and for prayers at the end of the liturgy. St. Basil the Great (329-379). Visitors also seem surprised by the movement during our liturgy. Worshipers walk up to the iconostasis to light candles and pray before the icons of Our Lord or the Holy Theotokos. Children are not sent off to catechism classes or partitioned behind glass in a cry room. With open space the children, like all participants, are liberated from the confinement of a pew and are free to move about during liturgy. For some children, the movement may simply be the result of their inability to sit still. For most, like the adults, movement is either the result of inspiration and personal devotion or part of the liturgy itself. While parents and siblings can be seen correcting children when they become rambunctious during liturgy, teaching them how to be reverent, you generally won’t see a scowl or a disapproving look from other participants. 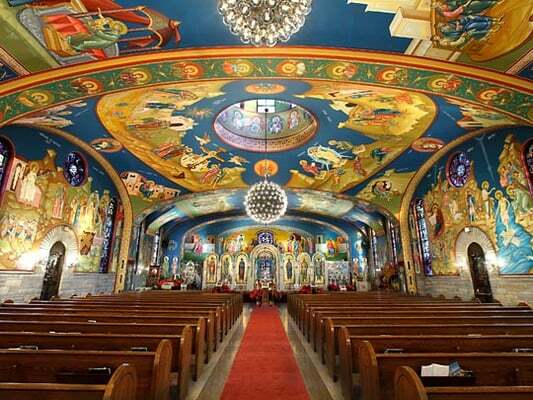 Since its beginning, St. Basil’s has had no pews, although at its inception it did have more chairs. The mission, just shy of ten years old, held its first liturgies in the chapel at Charlotte Catholic High School in South Charlotte. The chapel at the high school is like a small auditorium, with comfortable padded chairs arranged in a semi-circle, and the chairs were sometimes an impediment to our liturgy. Three years ago, the mission was offered the use of the chapel at St. Thomas Aquinas in North Charlotte and given permission to transform the space into a Byzantine rite chapel. Rather than keep the chapel’s rows of chairs lined up in imitation of pews, the mission chose to remove them to make the chapel more open like a traditional Byzantine church. The openness of the chapel gives clergy the ability to offer a more traditional liturgy and participants the opportunity to practice devotions that are part of our liturgy. The deacon can more easily make incensations, the clergy and altar servers can more easily process before the Gospel reading and Holy Communion, carrying the Gospel book and the holy gifts into the midst of the people. Participants in the liturgy can more easily venerate the Gospel book, come forward to surround the deacon when he chants the Gospel, make bows or prostrations at the appropriate times in the liturgy, light candles at the iconostasis, and venerate icons or the priest’s hand cross at the end of liturgy. Despite their initial confusion, the most reverent of visitors often are attracted back to our mission because of these very practices. Not everyone, however, likes the idea of having no pews. Occasionally visitors and Ukrainian Catholics, who have become accustomed to the practices of the Roman Catholic Church that have crept into the Ukrainian Greek Catholic Church in recent centuries, miss having pews. But they are in the minority. Those who ask why we have no pews generally are surprised to learn that this has long been the practice in Eastern churches, a tradition in Ukraine, and that Roman Catholic churches had no seating until stone benches were introduced in England in the thirteenth century and the wooden pew in the fourteenth. Many who visit St. Basil comment on how friendly the mission is to families with young children, particularly parents and grandparents. This, I am convinced, is one of the greatest benefits of our having no pews. You can truly see this when the participants in the liturgy move toward the front of the chapel to stand together at the chanting of the gospel, children among them and often right at the feet of the deacon who is chanting. In this moment, when we are all are gathered together as one to hear the Word of God, we seem to be answering the very call of Our Lord himself: “Let the children come to me, and do not hinder them; for to such belongs the kingdom of heaven.” I can think of no better way of showing children the way to the kingdom. Can We Call the Suffering of the Desert Fathers Virtuous? The photo labeled “worship without pews” is of Holy Resurrection Serbian Orthodox Cathedral in Chicago, with its distinctive spherical chandeliers. That church does, in fact, have pews. Thanks for sharing. As you might guess, this image clipped from the internet was to merely add interest and a visual aid for the article. We were in no way claiming this particular church did not have pews. An article about worshiping upright and not a single mention of the most prominent Christian groups that worship without pews? Thanks for your comment. If you mean Orthodox, the term “Eastern churches” used toward the end of the article embraces the Orthodox, as the phrase “traditional Byzantine church” earlier embraces all Byzantine, Orthodox and Catholics of the Byzantine rite. I felt no need to spell out that these terms included the Orthodox. Besides, many Orthodox churches in the United States have pews. Even so, the article isn’t a survey of groups or churches that worship standing or without pews, or a history of the pew — which is why there’s only a brief mention of when the pew began to be used. The focus is about a practice in one particular mission of the Ukrainian Catholic Church and why the practice is an advantage, with the hope that others, both Catholic and Orthodox, perhaps even Protestant, might also see this advantage and rethink the practice of using pews. The photo “Standing to worship” is from the Patriarchal Cathedral of St. George in the Phanar. This cathedral has row seating in addition to “stasidia” around the perimeter. Is there any kneeling during the liturgy? Or prostration? Thank you for your question, John. As a general practice we do not kneel on Sundays, because we consider each Sunday a day of the Resurrection, or as some call it a little Pascha (Easter). We also do not fast on Saturdays and Sundays. We are with the bridegroom! Instead of kneeling, at a typical Byzantine liturgy you will see a lot of bowing, making the sign of the cross, deep bows where the hand touches the floor, and veneration of icons. All are acts of reverence and piety, as is kneeling, but we emphasize the joy of the Resurrection on Sundays, the joy of Our Lord’s having trampled death by death, so we do not kneel. We do kneel and prostrate at various times in the year.